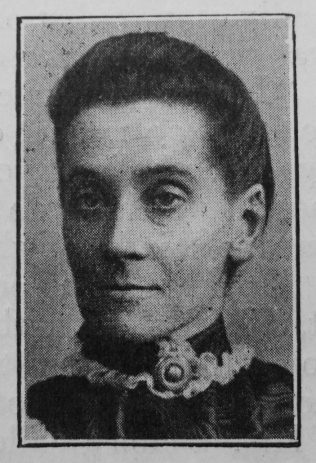 Early on the morning of November 5th, 1906, there passed away from the Cobden Church, Peterboro’, one of its truest and most useful members in the person of Mrs. W.J. Baker. She was born Nov. 11th, 1855, at Northboro’ in Lincolnshire, but in early life went with her parents to Peterborough. At the early age of twelve she made a full surrender to Christ, and joining the New Road Church, rendered valuable service. Removing, on her marriage with Mr. Baker, to Lynn, she became a member in the London Road Society, and later, on going to Nottingham, of Mayfield Grove Chapel. Here she did splendid work, and mainly by her influence and the associations of this church, three of her children, to her unspeakable joy, consecrated themselves to God. Never very strong, she was often laid aside by attacks of bronchial catarrh, but her trust in God never faltered and her interest in the church never flagged. Latterly she suffered very much, and in spite of all that medical skill and good nursing could do it was evident that the end was near. I called to see Mrs. Baker on the Sunday afternoon previous to her death and found her resting calmly and firmly on her Lord. She was an exemplary wife, an affectionate mother, a true disciple of Jesus and a worthy member of His church. Her life and work will be a source of inspiration to her husband and family while memory retains its power. Emma was baptised on 2 December 1855 at Northborough, which sits on the border between Lincolnshire and Northamptonshire. Her parents were John, a railway porter (1861) and Mary Ann. She worked as a general servant before her marriage. Emma married Joseph William Baker (1855-1914) in the spring of 1877 at Peterborough. Joseph was a railway engine driver. Census returns identify five children.